by Brand: East African Educ. Publ. Brand: East African Educ. Publ. This book was the winner of its catagory in the Gourmand-World Cookbook Award 2002 and serves as an excellent introduction for those wanting totry their hand at African cookery, but are uncertain about ingredients or what to do with these ingredients, to create that distinctive African flavour! 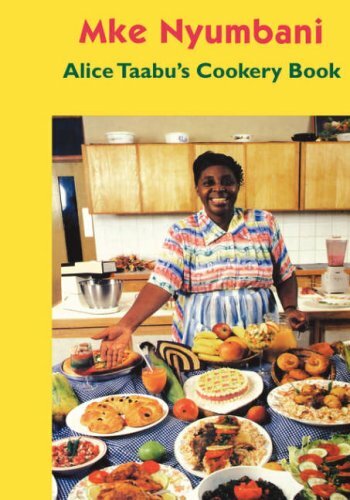 Alice Taabu is a household name in Kenya, best known for her demonstration of modern cookery on television. She has hosted the popular televisons how, Mke Nyumbani, for more than twenty years, and this book comprises a selection from over 500 receipes she has created for the viewers. The receipes are designed to be simple and affordable, and use both exotic and indigenous ingredients. Some examples of the tempting receipes on offer are: bean bread; Mabumbunda (banana bread); chicken and ugali; nutty chicken; fish with groundnuts; various Kenyan meat and vegetable dishes,e.g., irio (potatoes and peas), kimanga, cassava beans mash, matoke in coconut, mbaazi za nazi (pigeon peas in coconut) and pawpaw stew. General useful hints for cookery, food hygiene, how to avoid accidents and what to do if things go wrong, or with leftovers, are also included.